I finished the banner today (except for the fill in). I also got the giraffe and the little animal (a fox?) finished. I had to frog a few times though. I don't know what's wrong with me lately! It seems I'm frogging all the time! Well, my boys just got home from school (half day today) and they're hungry! Write soon! Looking good! I just love the animals in this piece! Lovely!!! Maybe it's a monkey? I think the frogging is becoming an epidemic at my house. Hope yours is done with! It looks good! I don't know what is up with the frogging lately. I've been doing the same thing - seems like every time I sit down to stitch I'm ripping most of what I stitched! Maybe it's a lemur? Love the giraffe and the progress that you are making. Sorry about the pesty frogs visiting, they are annoying, aren't they? Very nice! I thought the little animal was a baby lion? I may have to get this design one day just for that giraffe! My cousin would absolutely love it!!! Lost is looking Great !!!! Hope the frogs have hopped off! 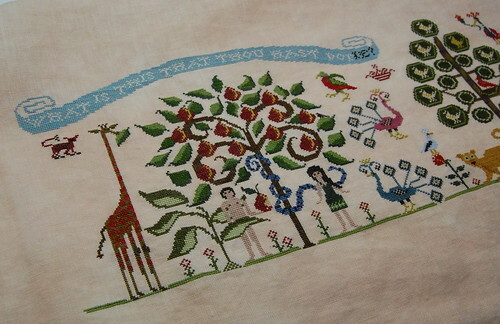 I really am crazy about this piece - must stitch it, soon. I just love that giraffe! Wonderful progress, Nicole. Great progress! Just love the giraffe. Ooooh~~~ I love the giraffe!!!! Every time I see this piece, I love it more and more! Boy, the colors just POP! on this one. What fabric are you using, Nicole? Sorry about the frogs, but your progress is still amazing! I can't always count correctly either! And a little frogging never hurt but it sure doesn't help. Have to quilt tomorrow so no stitching for me - boo hoo. 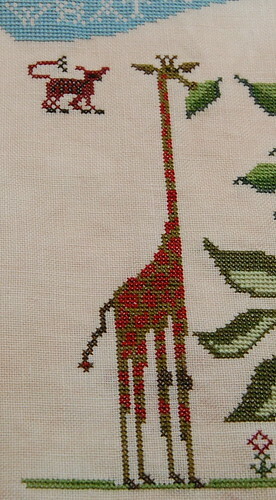 It's coming along beautifully - I just love that giraffe! I can't get over how nice this is!! Love your Paradise Lost! It's so fun watching your progress, makes me want to get mine back out :-).